How do you brand your bar or restaurant everyday cost effectively? 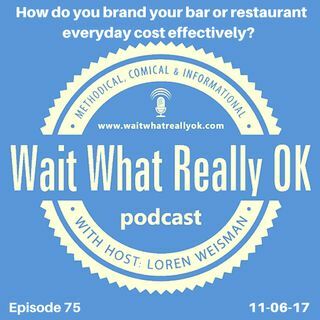 Wait What Really OK Podcast Episode 75 hosted by Branding Strategist and Keynote Speaker Loren Weisman talks about how bars and restaurants can brand, market and promote that much more cost effectively and efficiently every single day. Too many self proclaimed marketing gurus and experts are out there telling restaurants and bars that they have to spend a small fortune to correctly market and promote, yet they don’t ... Más informaciones include the information about how internal branding, marketing and advertising can not only take place, but become incredibly effective. How do you brand your bar or restaurant? By putting together a simple plan to build up and reinforce your brand, your message and your specials in a way that not only engages your existing audience while expanding to new customers, but is also something that can be done internally saves time, money and headaches. Take a greater initiative to expand your message with out expanding your costs. Ep 75 “How do you brand your bar or restaurant everyday cost effectively?” of the Brand Management and Marketing Podcast Wait What Really OK is available on iHeartRadio. Fully Licensed Wait What Really Ok Theme Song" by RKVC. Podcast Blog Supplement for Episode 75 of the Wait What Really OK Podcast with Loren Weisman. Podcast Link Supplement for Episode 75 of the Wait What Really OK Podcast with Loren Weisman. Your mistakes are not learning experiences if you are not learning. Podcast Video Supplement for Episode 75 of the Wait What Really OK Podcast with Loren Weisman. Podcast Photo Supplement for Episode 75 of the Wait What Really OK Podcast with Loren Weisman.